Pat McQuaid, President of the UCI, has told L'Equipe that he is prepared to strip the 1998 Tour de France title of Marco Pantani if his name is on a list of riders from the 1998 Tour who tested positive for EPO when the French Anti-Doping Agency (AFLD) re-examined the samples for research purposes in 2004. The list is to be released on July 18th by the French Senate as part of a doping inquiry. Marco Pantani won the epic Grenoble-Les Deux Alpes stage of July 27, 1998, a victory earned Pantani his first yellow jersey. 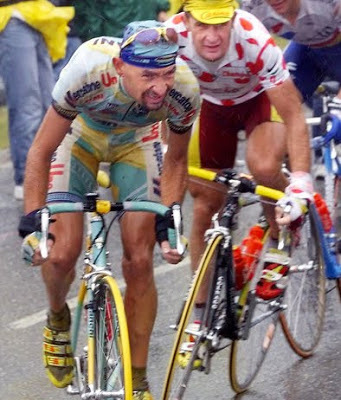 According to cyclingnews.com, "Marco Pantani’s parents have written an open letter to the UCI, the Italian Cycling Federation and Tour de France organisers ASO in response to speculation surrounding the retrospective analysis of urine samples from the 1998 Tour as part of a French Senate doping inquiry. “In criminal law, death terminates any existing or future proceedings against the suspect and the crime is also declared extinct,” the Pantani family said. “In sporting law, where the general principles of common law must be recalled […] the rights of defence for the accused must be absolutely guaranteed in their entirety, without the possibility of delegation. The possibility of stripping Pantani of his Tour was also criticised by Felice Gimondi, who was the previous Italian to win La Grande Boucle, in 1965. “It’s like when they lower the speed limit from 150kph to 130 – what do we do? Hand out fines to everybody who drove at 150kph before?” Gimondi told La Repubblica. Gimondi was critical, too, of the UCI. “They don’t have balls and they never have. They only make easy choices,” he said. “That boy might have made serious mistakes but he paid too high a price." Addendum July 2nd: The French Senate Commission report will now be issued after the conclusion of the Tour de France.